Among the visiting artists in residence at the arts this winter is Israeli Filmmaker Duki Dror, who wrapped up his tenure as Visiting Instructor in Film & Digital Media with a screening of his award-winning documentary, Mendelsohn's Incessant Visions. Dror—highly acclaimed for such politically-inflected documentary films as Raging Dove, a portrait of Palestinian-Israeli boxing champion Johar Abu-Lashin, and The Journey of Vaan Nguyen, about the Vietnamese "boat people" in Israel—is one of Israel's most prolific Israeli. 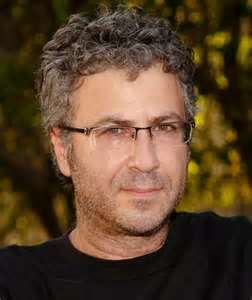 Dror was born in Tel Aviv and educated at UCLA, and his films explore politics and ethnic dilemmas simmering through volatile international settings. Mendelsohn's Incessant Visions, his latest film, deals with the tumultuous wartime romance of the famed architect and his wife Louise. Based upon 12,000 letters the couple exchanged during their lifetimes, the film traces Mendelsohn's sketches sent from WWI trenches to his wife-to-be in Berlin. After the war he became a flourishing architect, only to have it all turn to ruin when the Nazi's came to power. Escaping from Germany, the couple lived and worked in England, Israel, and California, where Mendelsohn taught at UC Berkeley. Dror's film movingly recounts this personal chapter in the larger story of modern art. Students of Dror's Winter Quarter course on Israeli documentaries enjoyed a rare first-hand account of the politically-charged fieldwork often involved in social documentary filmmaking. Also visiting campus this winter, Art alumnus Kevin Beggs, president of the influential Lionsgate Television Group, re-joined his alma mater community as a keynote speaker at last week's Scholarship Benefit Dinner. Beggs, a Porter College '89 graduate, heads up the award-winning production group responsible for some of the top properties on television, including the much-honored series, Mad Men, Weeds, Anger Management, and Wildfire. A highly-engaged arts advocate, and member of the Arts Dean's Leadership Board, Beggs has returned to UCSC often in the past to share his relationship between the campus and the entertainment industry. Beggs' career shot up through the ranks of film and television began when he produced the hit series BayWatch - and since 1998 he has developed Lionsgate's television series branch. Under his leaderhips, Lionsgate has grown into an Emmy-award winning empire of hits. His remarks at the 10th annual Scholarship Benefit Dinner helped to inspire attendees toward new heights of giving to support future alumni of UCSC.